India’s Polar Satellite Launch Vehicle, in its thirty ninth flight (PSLV-C37), will launch the 714 kg Cartosat-2 series satellite for earth observation and 103 co-passenger satellites together weighing about 664 kg at lift-off into a 505 km polar Sun Synchronous Orbit (SSO). PSLV-C37 will be launched from the First Launch Pad (FLP) of Satish Dhawan Space Centre (SDSC) SHAR, Sriharikota. It will be the sixteenth flight of PSLV in ‘XL’ configuration (with the use of solid strap-on motors). The co-passenger satellites comprise 101 nano satellites, one each from Israel, Kazakhstan, The Netherlands, Switzerland, United Arab Emirates (UAE) and 96 from United States of America (USA), as well as two Nano satellites from India. 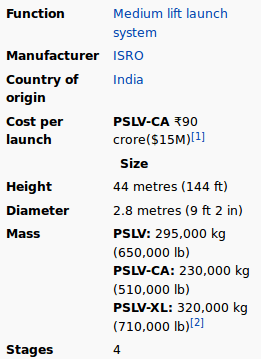 The total weight of all the satellites carried onboard PSLV-C37 is about 1378 kg. PSLV-C37 also carries two ISRO Nano satellites (INS-1A and INS-1B), as co-passenger satellites. These two satellites carry a total of four different payloads from Space Applications Centre (SAC) and Laboratory for Electro Optics Systems (LEOS) of ISRO for conducting various experiments. The 101 International customer Nano satellites are being launched as part of the commercial arrangements between Antrix Corporation Limited (Antrix), a Government of India company under Department of Space (DOS), the commercial arm of ISRO and the International customers. PSLV-C37 is scheduled to be launched on Wednesday, February 15, 2017 at 9.28 Hrs IST from Sriharikota. Maiden flight; attitude control failure at second stage separation. First operational flight; fourth stage under-performed resulting in lower than planned orbit. Satellite used own propulsion to move to correct orbit. First launch to have foreign satellites, and first to carry multiple satellites. First multi-orbit mission. TES and BIRD were injected into a nominal 568 km circular sun synchronous polar orbit, PROBA was injected into a 568 X 638 km elliptical orbit. Orbit was raised using RCS thrusters on fourth stage. India’s first launch to GTO. GTO payload capability has reached 1200 kg from 2002 onward, compared to 1050 kg previously. First use of lightweight carbon composite payload adapter. Payload capability had been progressively increased by more than 600 kg since the first PSLV launch. Launch took place despite heavy rain. First PSLV launch from the second launch pad. First flight of hardware upgrade, first launch of reentry capsule (SRE). First flight of the ‘Core-Alone’ configuration. ISRO’s first commercial launch (foreign satellite as the main payload). ISRO’s second commercial launch (foreign satellite as the main payload). First flight of the PSLV-XL configuration, first Indian Lunar probe. India’s first radar imaging satellite, RISAT. Rubin 9.1 and 9.2 intentionally remained attached to the fourth stage. SwissCube-1 was the first Swiss satellite, and ITUpSAT1 was the first satellite to be constructed in Turkey. AISSat-1 and TIsat are part of NLS-6. First use of Vikram flight computer. mRESINS tested avionics for future PSLV launches. ISRO’s third commercial launch (foreign satellite as the main payload). ISRO’s 100th mission. TUGSAT-1 and UniBRITE were the first Austrian satellites. India’s first regional navigation satellite. India’s second regional navigation satellite. ISRO’s fourth commercial launch (foreign satellite as the main payload). Seventh PSLV-XL and third Navigation Satellite launch. Eighth PSLV-XL and fourth Navigation Satellite launch. At the time it was the heaviest commercial mission (1439 kg) successfully accomplished using a launch vehicle assembled by ISRO. Launch of India’s first dedicated multi-wavelength space observatory and ISRO‘s first launch of US satellites. Commercial launch of 6 Singaporean satellites. Fourth stage re-ignition demonstrated successfully after payload deployment. IRNSS-1E, fifth navigation satellite of the seven satellites constituting the IRNSS space segment launched. It carries two types of payloads – navigation payload and ranging payload. This is the eleventh time ‘XL’ configuration is being flown. IRNSS-1F, sixth navigation satellite of the seven satellites constituting the IRNSS space segment launched. It carries two types of payloads – navigation payload and ranging payload. This is the twelfth time ‘XL’ configuration is being flown. IRNSS-1F carries Corner Cube Retro Reflectors for laser ranging. Launch initially scheduled for 10:30 was delayed by one minute to avoid space debris. ISRO’s Cartosat-2C and 19 other satellites launched. ISRO’s longest PSLV satellite launch mission. 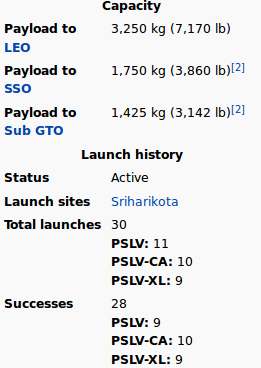 First mission of PSLV in which it launched its payloads into two different orbits.